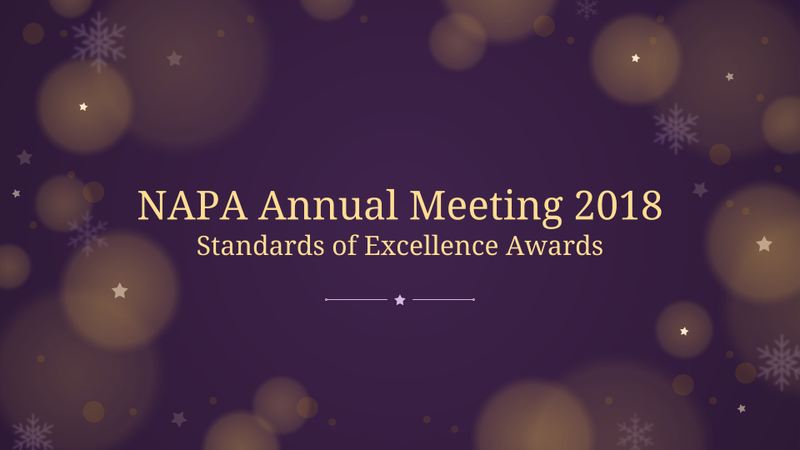 Indianapolis, IN—The National APIDA Panhellenic Association hosted its annual Standards of Excellence Awards at the close of the Association of Fraternity and Sorority Advisors Annual Meeting (AFAAM). The 2018 application cycle received 73 submissions reviewed by 12 judges across a mix of student affairs, fraternity/sorority headquarters, and corporate professional backgrounds. “On behalf of the National Multicultural Greek Council (NMGC), it’s a privilege to be able to read about the wonderful contributions and powerful impact that the NAPA organizations are making and having on their members, and in their campus and communities,” says NMGC Public Relations Coordinator Tanya Arditi. This year also marked the 20th anniversary of the National Association of Latino Fraternal Organizations (NALFO). Officers from NAPA attended their Awards Reception to commend the special milestone of the umbrella council. “As an interfraternal partner, we wish them continued success and look forward to continuing to partner and support their organizations and members,” says NAPA Vice Chair Vigor Lam. Photos from the NAPA Standards of Excellence Awards are available on NAPA’s Facebook page. NAPA organizations set the gold standard for Asian Pacific Islander Desi American (APIDA) fraternities and sororities. In addition to meeting the association’s base standards, NAPA member organizations are exposed to resources and expertise to help them continually improve and be the best they can be. Universities, Greek Councils, and students want the best APIDA fraternities and sororities on campus and they can find them in NAPA.